Modern technology is not a prerequisite for successful navigation. The basic navigation skills are enough and essential to any survivalist or outdoorsman and especially people into sailing. Pinpointing true north is amongst the basic essential skills required by sailors, outdoorsmen, and survivalists. This skill is challenging in that a compass denotes magnetic north instead of true north, that is, the redpoint directs towards magnetic north. Magnetic north and the true north are close, but successful navigation could be hindered by this distance. The ability to adjust a compass’ declination is needed in order to overcome this challenge. How Does Magnetic North Work? Is It important To Adjust For Declination? The angle difference between magnetic north and true north is known as magnetic declination. This angle varies depending on the position of the compass holder on earth. The declination will be different for different parts of the world as the magnetic field of the earth is not uniform. The variation may be caused by numerous factors including the metal in earth’s core, an area’s unique geographic features, and a person’s position relative to magnetic north. Declination can be adjusted by first understanding the difference between true and magnetic north, then secondly, understanding how the difference in distance is compensated for. Magnetic north is where a compass points to when checking a reading while the true north is the actual north pole of the earth. The earth’s core elements and magnetic fields are the sources of a magnetic north. Lacking the presence of magnetic interference nearby, a compass should always point north, that is, towards the magnetic north. A thought experiment would enable an easier understanding of this. If the earth were a gigantic magnet and a compass a tiny magnet, both would follow the laws of magnetism. The south pole of the compass would be attracted to the North Pole of the earth and vice versa. In actual compasses, the pole that points towards the magnetic pole is red and maintains a positive charge (South Pole). Unlike the true north, magnetic north moves by several degrees overtime, east or west of true north. A considerable amount of movement is due to the flowing molten fluids of iron, cobalt, nickel, and other metals deep within our planet. Secular variation is the name given to these changes in earth’s magnetic field. The position of the magnetic north may also change due to geographical features like mountains or ledges. Lava beds, certain ore deposits, and faults can also shift magnetic north. Not making an allowance for magnetic declination can put someone off their course slightly, according to the United States Search and Rescue website where different scenarios are illustrated. A large declination may result in a much longer hike while a small declination may barely make a difference. It is therefore important to have the latest declination information, often found on printed topographical maps in the lower corner. This information might require regular updating. 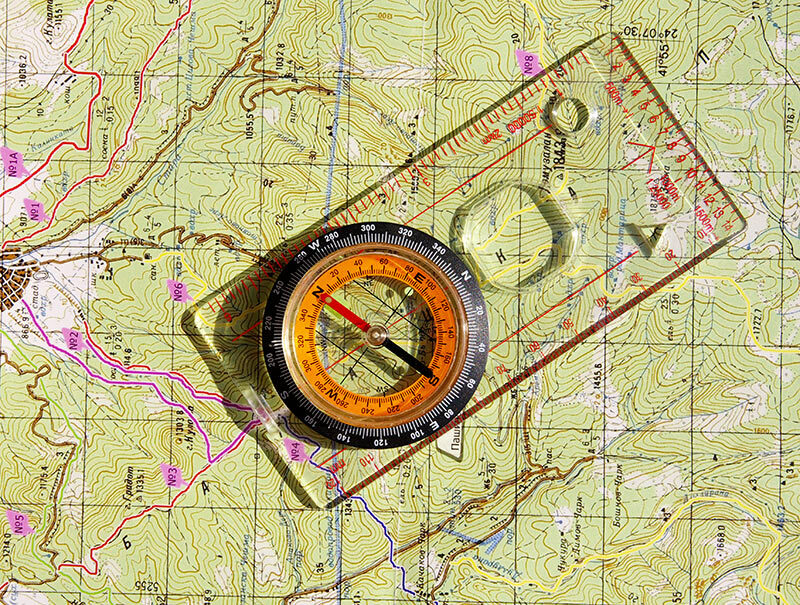 Assessing the position of true north is possible by applying various methods using a compass and a map. An old compass or some models may not be adjusted for declination. For navigation, the declination information of the area will need to be retrieved from a map. A map will indicate magnetic north, grid north and true north. An updated map will have information that is more accurate on the angle of difference between true north and magnetic north. The local declination when true north is west of magnetic north should be positive. The local declination when true north is east of magnetic north should be negative. The following methods can come in handy when assessing the direction of your destination. Create a line from your origin point on the map all the way through your destination until the map’s border. Place the compass on the map and, at the point where the map’s borderline and your bearing intersect, the needle’s pivot should be directly on top. Rotate the dial until the map’s north is aligned to the compass’ north. Is this new bearing giving you the correct direction to your destination? Use the above bearing to subtract the declination figure derived earlier if the declination was positive. If the declination was negative, add it to your bearing. The figure arrived at above will be your benchmark as you try and dial the compass up to this figure. This should be done until your index line is aligned to it. Now, your compass should be pointing away from your travel direction. While lifting up the compass, rotate your body until the orienting arrow and red needle portion are overlapping. Redo the steps after every encounter with a landmark till you arrive at your destination. Create your bearing by connecting your point of origin and destination by making a line. Ensure metallic objects such as belt buckles, mobile phones, or car keys cause no interference. Align the baseplate of your compass to the bearing line drawn. Assess whether your destination is in your current travel direction. Rotate the dial until the map north is aligned with the ring north. The compass should not move. 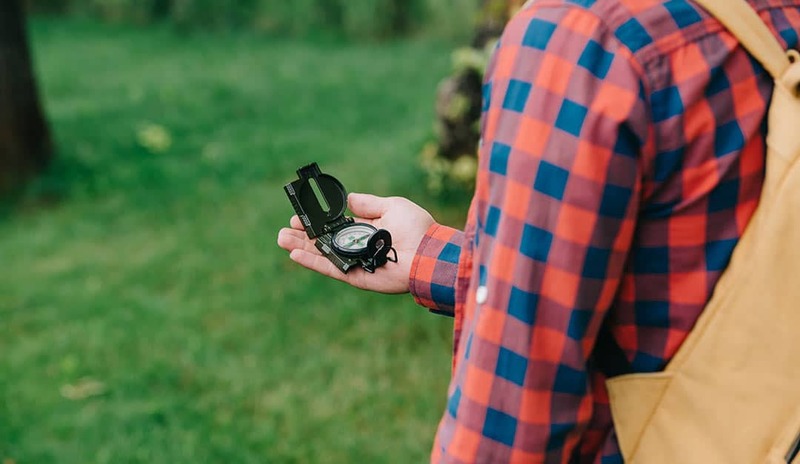 The travel direction orientation when you lift the compass should be directly opposite from you. Rotate your compass and your body in one motion until the orienting arrow overlaps the magnetic needle. Adjust your dial according to the declination values of the local area. Subtract a positive declination from your bearing, this will entail a clockwise turn of the dial. Add a negative declination to your bearing, entailing an anti-clockwise turn of the dial. With the arrow pointing towards your destination pointing away from you, rotate your compass and body until the orienting arrow is directly below the red arrow of the magnetic needle. Take note of any landmarks in your route and redo the steps when you reach each landmark. With the tips above you can deal effectively with getting lost and adjusting for declination. They will be essential in navigating unfamiliar locations when paired with adequate information like local declination from local authorities. Shawna currently lives in Las Vegas where she gets in lots of great hiking at Red Rock Canyon and Valley of Fire State Park. When she has time, she visits National Parks in a quest to visit each one in the U.S. Shawna’s favorite outdoors activity is hiking and her favorite National Park (so far) is Badlands National Park in South Dakota.